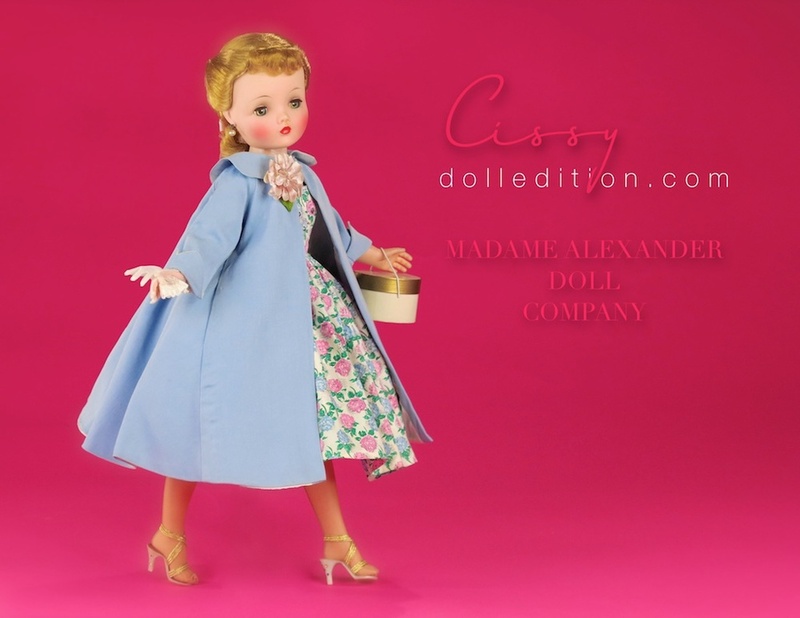 From FAO Schwarz, Cissy is wearing a blue cotton 1957 swing coat No. 23-12 with a peter pan collar, detailed with pockets and white taffeta lining. Although the corsage does match the flowers of one of the hats sometimes seen with this outfit, it may have been added to replace the roses usually seen with this coat. Cissy - casually walking the runway, making and entrance or maybe on a mission... appearing effortless indeed. Well, maybe not. Practice makes perfect, but wires, hidden stands, a carefully placed prop to lean on and even the dolls natural balance certainly helps the illusion of a little magic. The mission is to capture a moment in time and play with the natural qualities and texture of the fabrics that the doll is wearing — may suggest the appearance of movement. Often it's the mantua of tweaking ever so slightly an arm, leg or tilt of the head. Cissy was so well designed, that almost 70 years later she's still got what it takes.... No super model, Victoria's Secret angel or queen of the red carpet, except maybe Queen Elizabeth, can claim that long of a run! Cissy is wearing a 1958 clover and floral print cotton dress No. 22-25. Trimmed with Val Lace and sprinkled with rhinestones, it is paired with high heeled shoes from Premiere. Accented with multi colored stones in the heels and gold metalic elastic straps - all the rage in Paris. Mid Century fashion had a fascination with sparkle and an element of excess. Struggling since the 1930s, Americans wanted to be entertained and even amused by their mid-century fashion statements. Lissy 1957 Bridesmaid No. 1161 - 12". Ankle length gown of sheer nylon with inserts of wide val lace & floral nosegay. 1957 - what year for the Alexander Doll Company! Not only was Cissy's phenomenal popularity peaking, Cissette, Elise were introduced the same year. They would all be introduced in the newest technology of infused plastics, with Cissy making the switch over from her painted finish introduction to the latest and greatest development of infusing the color into the plastic vs the layers of painted finish over raw plastic. This featured mint in box 1957 Lissy Bridesmaid is quite beautiful. "Beautiful" is perhaps a cliche when describing many of the dolls of this golden era, but in this case, what else can you say? Beatrice Alexander loved costuming and excelled in the colors, details and thoughtful, sometimes unexpected, touches. In this case, the beautiful touch of val lace against the sheer lilac nylon with touches of tiffany-blue/aqua flowers as an element of surprise. Lissy embraces the the tradition of the young ethereal bridesmaid of mid-century America. This Lissy Bridesmaid also came in different soft colors and as a boxed outfit. This beautiful Lissy Bridesmaid was also featured at FAO Schwarz. The Lissy Bridesmaid featured a pulled back hairstyle with curls at her neck. Shoes are gold with pale pink elastic. My Debutante - a celebration of Richard Bostard and his vision. Interrupted by his Alzheimer's, this tribute at the MADC Philadelphia Convention will be auctioned off. This hardcover book comes with the doll, and wardrobe. My Debutante - coming soon to a Madame Alexander Convention (near you?). A tribute to my longtime friend, costume designer, Cissy collector extraordinaire and Alzheimer's patient. Richard did costumes for TV, stage and for the LA Opera. He started out doing children's clothes in New York City, which gave him a unique understanding of commercial sewing. 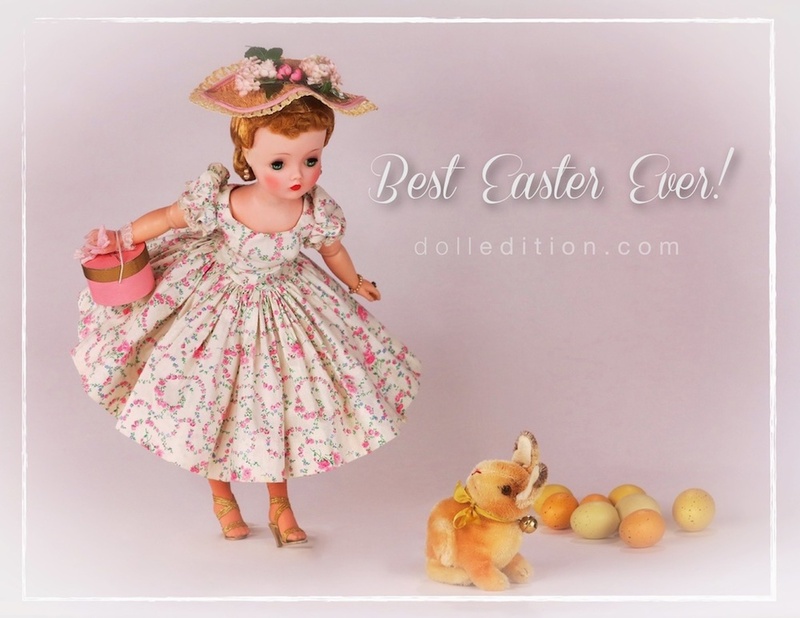 As these things tend to happen, we crossed paths at a doll show in the late 1980s in Glendale, CA, both budding Cissy collectors, and stayed friends during the good, best and ugliest times. In hind site, our friendship was long distance because my design career tended to take me where the action was, which was for many years a confused place called Las Vegas. One of the ways of communicating was helping Richard develop a project he called "Debutante". 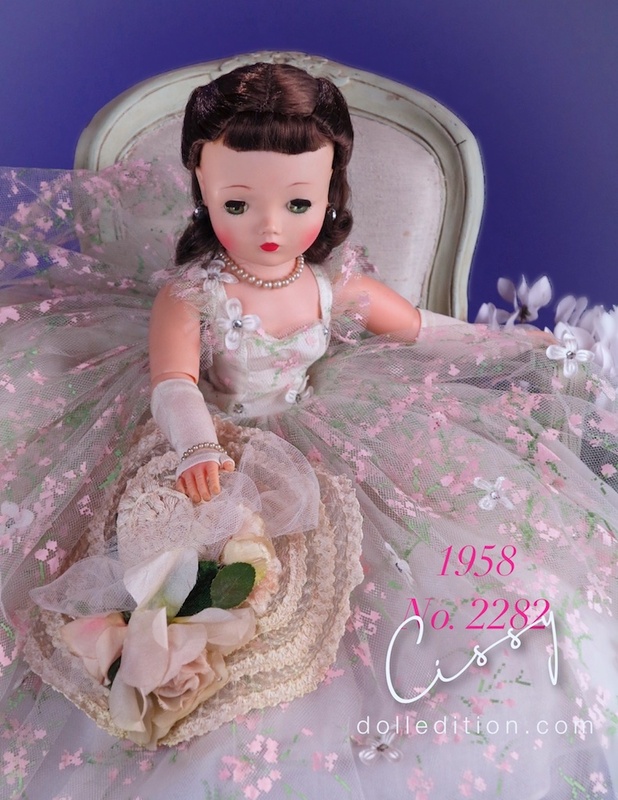 He liked to create clothes for Cissy that were timeless - vintage but they could be worn today. He often tried costume ideas on Cissy first - so Debutante could, for the most part, be translated for people too. Another part of staying in touch was attending the Madame Alexander Doll Club Conventions - usually if they were within driving distance. While sometimes getting there was an emotional and "will they or won't they" roller coaster ride, the MADC event itself was sublime. Getting away from life's ick factor was such a relief, and a chance to be, well somewhere from silly to stupid. Richard also used a couple of the conventions to test the waters of his Debutante concept, and to enjoy the company of others that came from hither and yon to participate in these virtual doll summer camps. As Richard has coped with his Alzheimer's, he started sewing and creating for Cissy with an intense passion that I think only his own minds eye could completely understand. He wanted to recreate the scenario of the conventions, the elements of the unknown, new and rekindled friendships all around dolls, dolls and more dolls. For the past two conventions we attempted to make it happen, but Alzheimer's is not a patient condition. In mid-planning, the 2013 trip was canceled, and the idea was retired once and for all. With the help of Richards brother and wife, I've gathered some of the outfits Richard was working on and put them together as we would have done in years past for his Debutante. This wardrobe, along with a hardcover book of My Debutante will be donated in Richards name to the 2014 August 6-9 MADC Convention in Philadelphia to be auctioned off. Hopefully, this will add a little excitement and merriment for all - and leave a pleasant footnote to Richard's love of dolls, costuming, people and MADC. Ptaltinum Gala - dressing up for a gala is like being a kid again. Anything is possible! 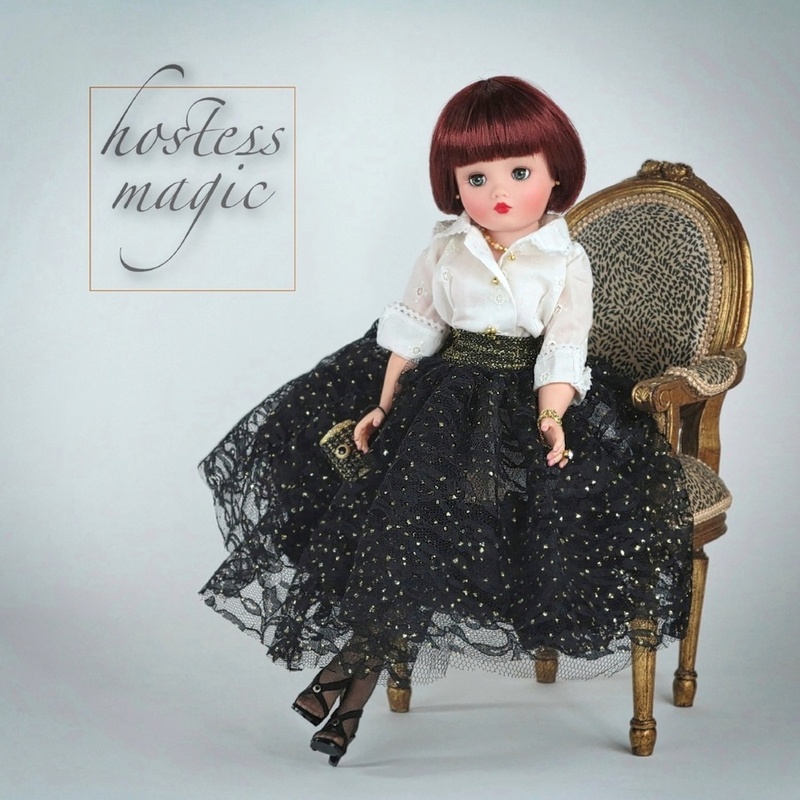 Hostess Magic - home entertainment has so many levels to be successful. Dress for the unexpected! Cosmic Evening - the timeless elegance of the ballerina length "demi longueur". The paisley design reminiscent of night clouds in an impressionist painting. "My Debutante" sold for $3,000 to benefit MADC! Dreamy Blue Linen - Smartly tailored linen suit with contrasting patterns all makes for a splendid summer statement! Cristp, Cool & Casual - breezy, fun and casual! Take relaxed to the next level! Walking Angel - out and about town with her puppy Angel. Together, they are ready for the Debutante experience! Jacqueline 1962 #2125 - brocade ball gown with flaring side panels of deep pink satin. One of the stunning evening gowns in the feel and essence of Oleg Cassini created by the Alexander Doll Company of their 21" fashion doll "Jacqueline". As legend goes, Jacqueline was pulled from production mid-1962, making the dolls of this year rare. 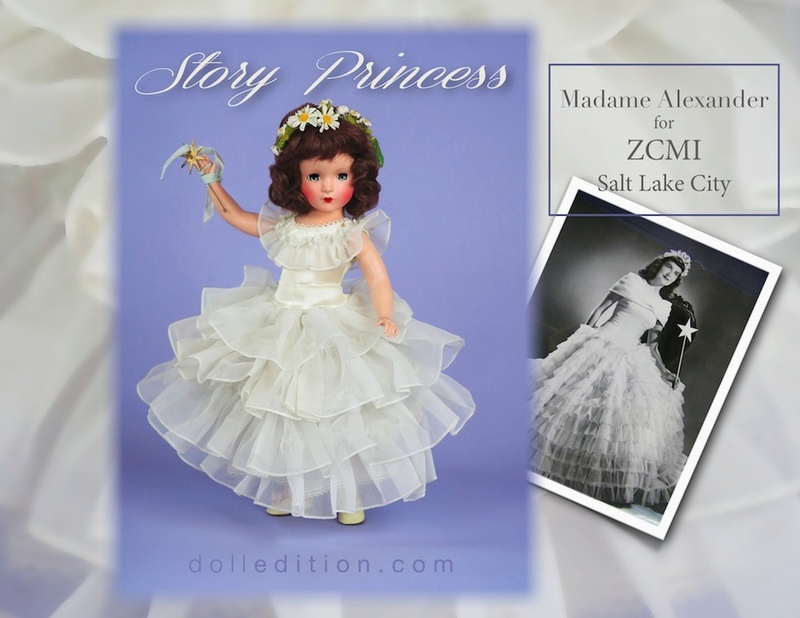 Jacqueline, the doll, was the perfect complement for the Alexander Doll Company. Taking the concept of the adult fashion doll to the next level, Jacqueline had both the manufacturing technology and fashion working for her in this success story in the making. 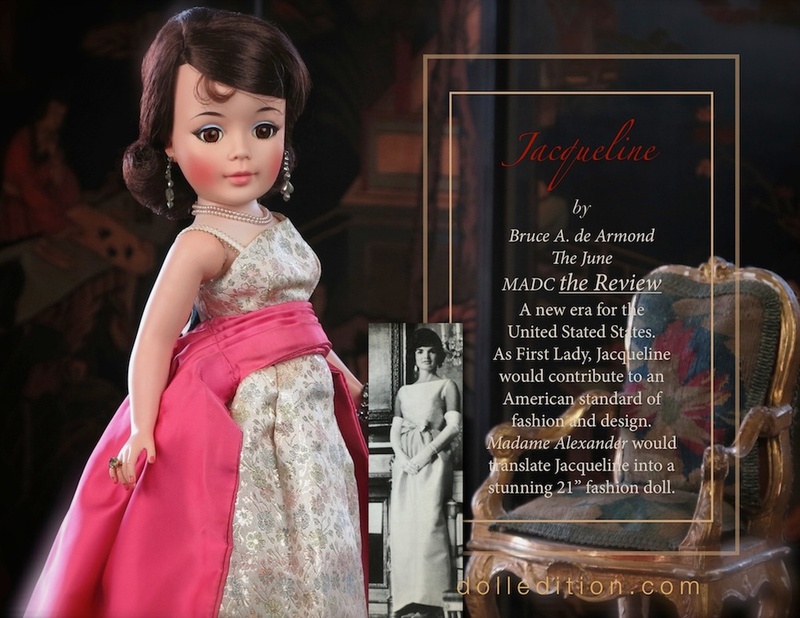 Calling the doll Jacqueline, just short of inferring that this is actually the First Lady of the United States, was not the same as acquiring a licensing agreement. As beautifully as the doll was conceived, introducing for the company their newly developed vinyl mold and rooted hair on a fashion doll – there would be a price to pay for rolling the dice and hoping the White House would not notice. The clothes for the Jacqueline were beautiful, capturing the essence of Oleg Cassini minimal design and line with beautiful fabrics and trims. Mid season 1962, the letter from the White House arrived and the Alexander Doll Company’s Jacqueline was retired to avoid legal proceedings. Many of these Jacqueline’s acquired a new name and were reassigned a new persona. Jacqueline is featured in my article for the June issue of the MADC the Review. Embassy Tea, on the right, was the last outfit produced of Jacqueline. Intended for the 1963 season, the mid season 1962 cancelation of Jacqueline left most of these gowns off the store shelves and in stockrooms. Mint in Box 1937 composition McGuffey Ana with her School House hang tag - a beautiful collaboration with books and literature. 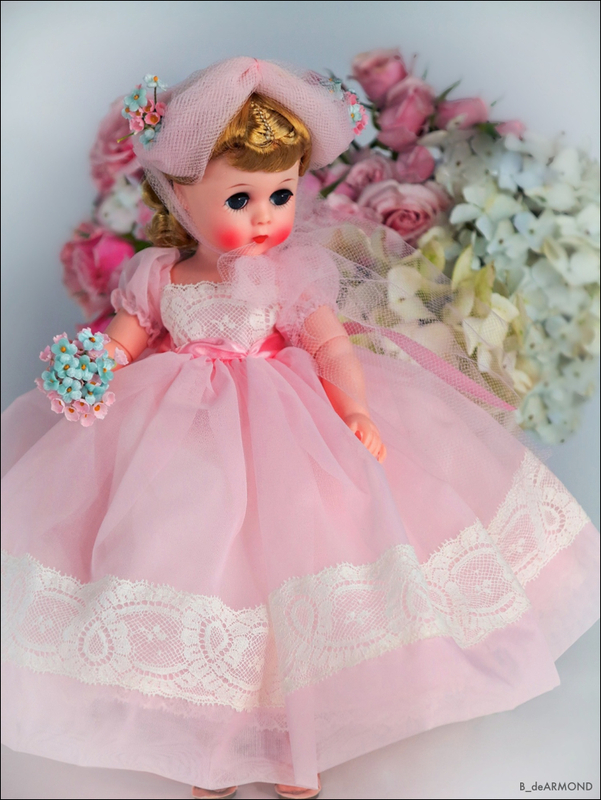 The doll exhibits the progress of the still young company and it's mastering of composition finishes. 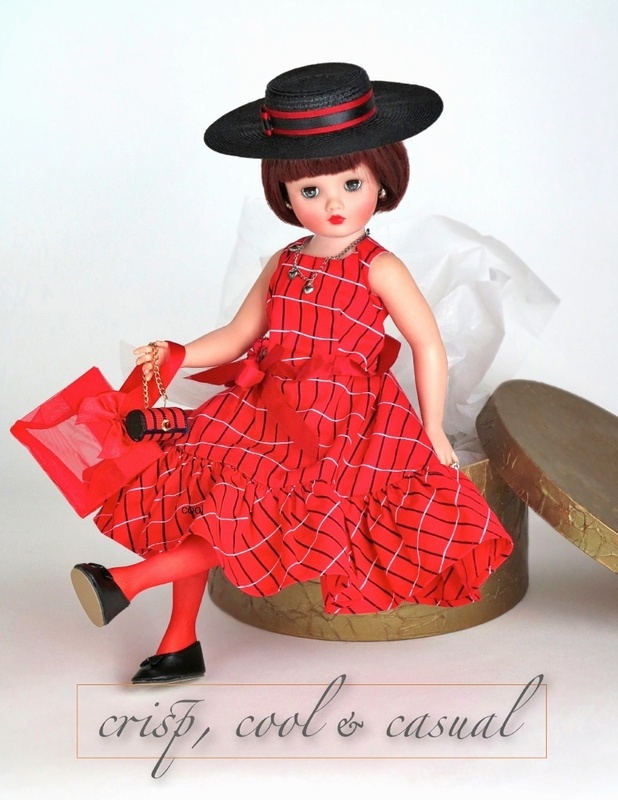 With vintage and antique dolls, it's not often you can say "mint in box - no excuses". This 1937 composition McGuffey Ana meets that rare standard. 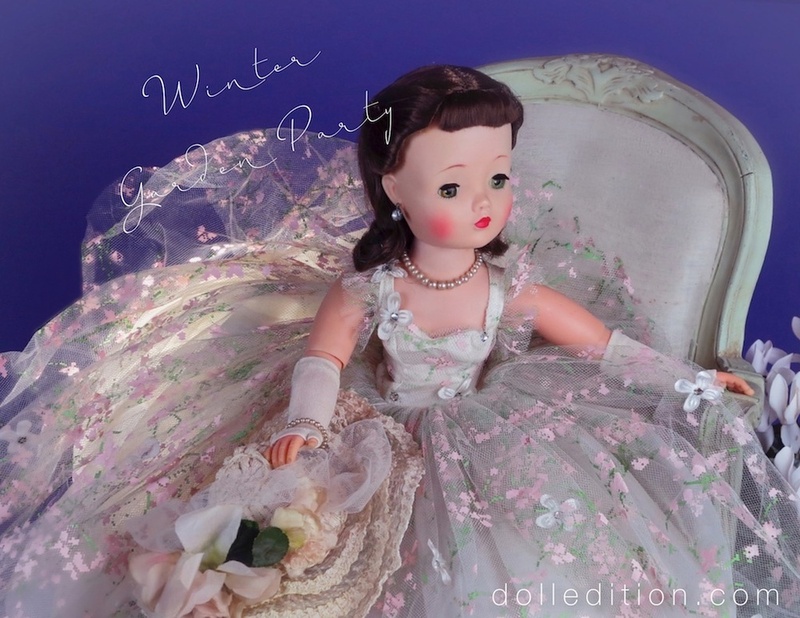 Mint dolls, in virtually undisturbed condition, offer a rare opportunity to study their intended vision by their creator and the company manufacturing the doll. The composition finish of this doll is clear, bright and a remarkable example of the composition standard Madame Alexander was striving for her still fledgling doll company. Not only the finishes, but the costuming is representative of this design vision - colors, textures and detail are all in play to help create a unique niche in a crowded market Alexander was competing in. Another interesting detail is the condition of this dolls eyes. One of the features typical of these lovely old composition dolls is the deterioration of old glassine eyes. In this case, they are as clear and intact as the day the doll left the factory. How this doll survived in this condition is unknown to me. Whatever the history of this particular doll, she can now be enjoyed as part of the art of Alexander, almost as a moment in time revisited. Having it's original McGuffey Ana School House hang tag gives another interesting look at the dolls total concept from design to marketing by Madame Alexander. This kind of licensing and collaboration with books, film and the Arts would become a keystone of success for the Alexander Doll Company.